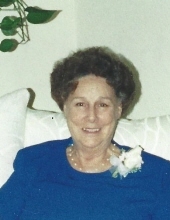 Hazel Claire Tetreault, 88, of Milford, NH passed comfortably and peacefully, surrounded by family, on January 25, 2019, at Greenbriar Terrace Healthcare, Nashua, NH. She was born in South Weymouth, MA on September 5, 1930, daughter of Evelyn Suitor (Morris, Breen) and Arthur Breen. Hazel married Leo J. Tetreault on November 21, 1953, in Westville, NH. They had 55 years of marriage until Leo’s passing in 2009. After Leo retired from the U.S. Army, they made their home in Milford, NH for 31 years, then Sun City Center, FL for 8 years. After Leo’s passing, and being a “New England girl”, she eventually made her way back to New Hampshire for 5 1/2 years, until her passing. Hazel was a natural caregiver and attended the Hale Hospital School of Nursing in Haverhill, MA. She continued to work at the Hale Hospital as a labor and delivery nurse until the mid 1950’s when she left to raise her family. Hazel was known for her way of calming even the fussiest baby with incredible ease. She also studied art for a time in Boston. She lived a full and adventurous life. While living in Brockton, MA she was friends with boxer Rocky Marciano who would go on to become Heavy Weight Champion of the World. Throughout her life she loved the ocean, the feel of the sand between her toes and the smell of the salty air. As a teenager she could often be found at Hampton Beach basking in the sun with her girlfriends and in later years, with her family. She had a love of travel and adventure. She was always ready to jump into the car or plan a trip. As the wife of an army officer, she lived on, or around, numerous military bases in Georgia, Alaska, Maryland, New Jersey and Massachusetts, concluding with 3 years in Stuttgart, Germany. While there she traveled extensively throughout Europe with church groups and family. Hazel and Leo enjoyed trips to Foxwoods Casino or Atlantic City, and playing Bingo. Music and singing was always a love of Hazel’s. She had the voice of an angel and enjoyed when she could sing her children and grandchildren to sleep. As a young woman, Hazel and Leo often sang in community musical productions. Hazel had a great sense of humor, and was very funny with a quick wit and a comical comeback always on the tip of her tongue. She was fun loving and always up for a good time. Hazel had a very caring, compassionate heart and was always available to lend a hand. She was an animal lover and had several dogs over the years. Being very artistic, she made the banners that hung in the Catholic churches with which she was affiliated. Hazel was a die-hard Red Sox fan and looked forward to each new season. She loved cheering and rooting for her Red Sox, as well as at her grandchildren’s games. She was predeceased by her husband of 55 years; her parents Evelyn Suitor and Arthur Breen, step-father Floyd Suitor, sister Sharon Dubrieul and brother Robert Breen. Hazel was a loving and devoted wife, mother and grandmother; blessed with 5 children, 13 grandchildren and 5 great-grandchildren. She was most proud of her family. She is survived by four sons, Michael Meyer and wife Michelle of Beverly, MA; LTC (Ret) Steven Tetreault and wife Deborah of Lawton, OK; Curt Tetreault and wife Janet of Ruskin, FL; Allan Tetreault and wife Amy of Caladonia, NY; and one daughter Marcey Phillips of Hooksett, NH. Grandchildren include Andrew, Kathryn, Susan, Sherry, Tyler, Jackson, Josiah, Daniel, Timothy, Matthew, David, Sarah and Brooke. Great-Grandchildren include Carson, Blakelee, Easton, Koby and Alaina. She leaves behind one brother, Arthur Breen and wife Susan of Bainbridge Island, WA; as well as several nieces and nephews. A calling hour will be held on Thursday, January 31, 2019 from 4:00-5:00 pm in the Smith & Heald Funeral Home, 63 Elm Street, Milford, NH, with a memorial service immediately following. A graveside service will be held in the spring/summer at the NH State Veterans Cemetery in Boscawen, NH where she will make her final resting place alongside her loving husband, Leo. If a donation is preferred in lieu of flowers, please consider Amedisys Hospice- Londonderry, or your local Humane Society. "Email Address" would like to share the life celebration of Hazel C. Tetreault. Click on the "link" to go to share a favorite memory or leave a condolence message for the family.